Lake Forest's Beautiful City Hall Building Was Jammed Pack With Senior Citizens On This Special Cross Walking Day. Read The Story To Find Out How They Reacted To This Cross Walk. Cross Walking And praying For The Men, Women, Children And Families Living In East Los Angeles. After a special walk in downtown Los Angeles, I headed west on 6th Street that eventually turns into Whittier Boulevard and headed for the heart of East L.A. 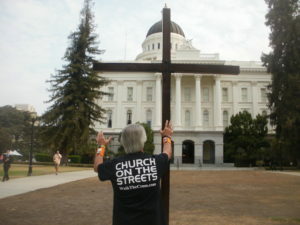 It was late, so I decided to get a motel room for the night and walk the cross in East Los Angeles the next morning. Los Angeles skyline on a warm and beautiful sunny day in southern California. Los Angeles. A city of over four million souls. Today the Spirit of God has brought me to this the second largest city in America. A city I’ve been wanting to walk the cross in for a long time. Now, as I headed toward this city that thoroughly dominates southern California, I wondered what I would tell the men, women and children I came upon. Would they listen to the message of the cross, of Jesus Christ, and of God’s love for them? I really didn’t plan on walking the cross at Hemet. But the Holy Spirit made me aware of a frightening problem in this city that, left unchecked, could hurt many people, starting with the city’s Thin Blue Line. So I gladly traveled the thirty-five miles or so from Riverside, and journeyed to this beautiful city of about 67,000 souls. The trip was easy and the scenic views filled my soul with joy and awe of God’s creative power. This is a beautiful valley with several lakes. It wouldn’t be bad at all to live in a place like this. As I traveled down the scenic route leading to Hemet, I orally and loudly put on and took up the full armor and armaments of God and then ate the nine spiritual fruit of the Spirit, which I always do before cross-walking any city or town. I was now ready for spiritual warfare. Since 1973 I’ve had the pleasure of working for the Lord as an evangelist. Some one million men, women and children later, it still blesses my heart every time I get the opportunity to shake someone’s hand, talk with them about Jesus, and pray for their needs. As I entered Riverside County and the city of Riverside itself, I felt the Spirit rising up inside me. Couldn’t wait to park the “go-ye-mobile” and walk the cross in this beautiful city as well. Glory Hallelujah, look what God is doing all across the land of California! After a successful cross-walk mission in Pasadena, I traveled some fifty miles east to San Bernardino, a beautiful city that, on this day, was drenched by a pouring rain. But the Cross Walker loves to walk in the rain. Parking about one block from City Hall and the main downtown area, I unstrapped the large cross from the cab and bed of my “go-ye-mobile.” Already people began to gawk and look upon the scene of an evangelist getting ready to tote a large cross throughout their streets. The world-renown Rose Bowl, home to some very great and exciting college football rivalries. What a way to start a new week of cross-walking. Beautiful day in Pasadena, home to the nationally-known Rose Bowl. Arriving downtown, I found a great place to park, just a block away from City Hall. The people were already awake, even though it was around 8:00. Already getting all kinds of smiles and car horns blowing as I made my way to the massive City Hall building. The Spirit of God was in this place, that’s for sure. Tustin, California. Home to Trinity Broadcasting Network, the largest Christian television ministry in the world. After walking the cross in Santa Ana, I loaded up the large cross on my “go-ye-mobile” and traveled the short distance to the television network. I then visited Pastor Ed Smith at Trinity’s on-site Church.